Thank you for your interest in putting up a lawn sign in your yard or window! We're working hard to make sure residents across the city know about the proposed Energy East pipeline, and know the risks the pipeline represents to our city and our climate. 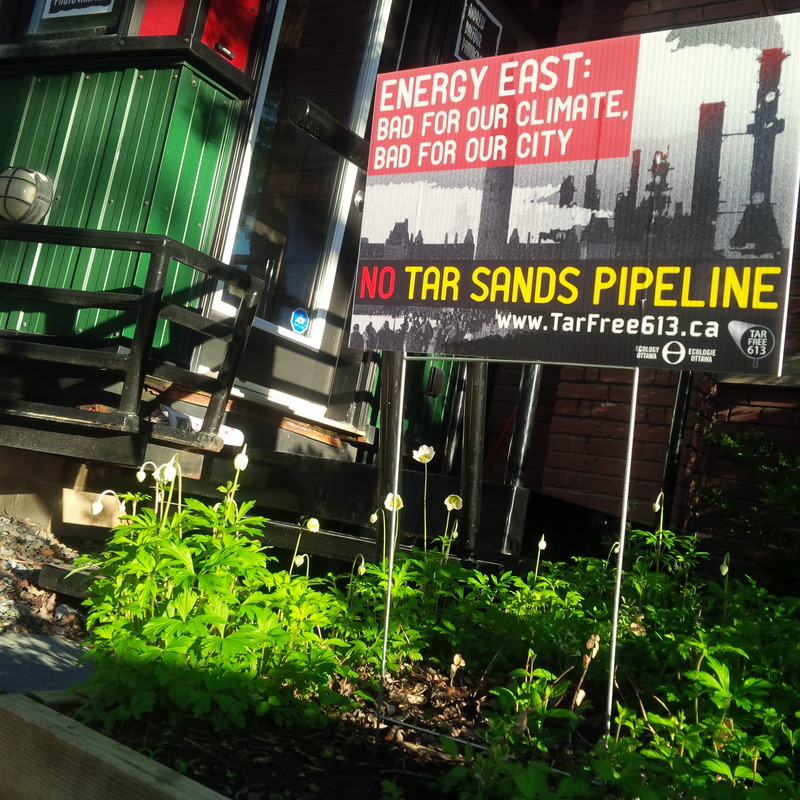 Our goal is to make these lawn signs a fixture across Ottawa, so that everywhere politicians and people go across the city, they're visually reminded of the growing opposition to the tar sands pipeline, from coast to coast to coast. Will you commit to putting one up in your yard or window? We're providing them for free to anyone who wants one. Simply fill out our survey below. Q: Do you want to receive a lawn sign at your house? Q: Do you have any specific instructions for placing the lawn sign? A: front lawn, to the right of the driveway. Q: Do you want a lawn sign? A: Door step is fine please. I will place it amongst my tiny flowers in the front! A: Please leave it on the porch. A: On the doorstep would be fine. I will likely place it inside the window until warmer weather in the spring. Thank you! I just signed up to have @EcologyOttawa put up a lawn sign at my house saying no to the #EnergyEast pipeline - will you? A: Please leave it on my doorstep and I will put it out by the street where people can see it. I live out of town so if it is easier if I come and get it from you, let me know. A: Just leave it on our doorstep and we will install it ourselves. Thanks for the opportunity of participating in this very worthwhile project. A: Place the sign near Madeleine Meilleur’s sign. They might have to be moved due to work to be done on garden but for now, it’ll be fine. A: Leave on doorstep. I will ensure it is okay to put on the side of the property by the highway and if so put it up myself. Thank you! A: It’s an office in the University Centre, so if you could drop it off at the front desk, that would be swell. business hours. They’re open at 10 in the morning till mid-to-late afternoon weekdays.